operations and now sells his unique products globally. to the human hand in size, shape and also movement. 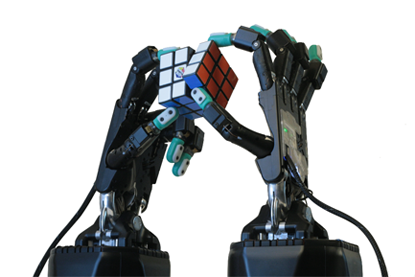 hand is able to complete with the attachment of a collaborative robot, such as the universal robot. The shadow robot hand has 24 joints, with 20 degrees of free movement (more than a human hand), with also force sensors and extremely sensitive touch sensors at the end of all finger tips. The Shadow Hand contains an combined amount of 40 Air muscles which make the robotic hand move, the air muscles allow the robot to be compliant giving it the ability to work around soft fragile objects without damaging them. The Shadow Robot will be able to assist operations in pharmaceutical environments, as well as in universities, job sites that could be dangerous for humans and also lending a helping hand in research of hazardous materials. The Shadow Robot is the best robotic hand on the market at the moment with the closest approximation of the human hand currently possible. Our robotic automation team can discuss requirements, suitability and integrate these product into your business.